Reach to the top of your sport--the diver level unrivaled in the recreational ranks: PADI Master Scuba Diver rating! This certification denotes that you have reached the highest recreational diver level in the PADI system of diver education. To put yourself on top and reach master scuba diver level you need to be at least 15 years of age. If you're just starting your first scuba class, or if you've been diving for years, the master scuba diver rating is the ultimate goal for all divers. In fact, as soon as you start your open water course you are working on your master scuba diver rating! While you are progressing through the advanced, rescue, and specialty courses you are also completing key portions of the Master program. This is the highest non-professional rating in scuba diving and one of the most exciting and rewarding programs around. 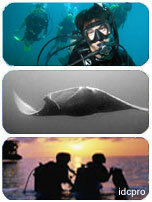 Contact us for more information or select a dive course below.